There’s probably a week celebrating just about everything in the UK, and our fast food favourites are no exception to the rule. Many food-related events are designed to run alongside competitions – best pie, best fish and chip shop and that sort of thing. Others have a more serious, awareness and fundraising element to them. But each special fast food week in the UK is a great excuse to celebrate the best in good old British fast food! Whether you have a penchant for a fat chip, or prefer a delicate skinny fry, you can make the most of your chip craving in February every year with National Chip Week. The week is run by the Potato Council in an effort to promote chip diversity, and celebrate the British love affair with this humble potato derivative. The Potato Council itself is funded by potato growers and trade purchasers and is part of the Agriculture and Horticulture Development Board. It might come as a surprise that around a quarter of all the potatoes that are grown in Britain eventually end up as chips – a total of around 1.5 million tonnes of them – so the chip shows no sign of losing any of its popularity in the UK. The week has its very own website, if you want to find out the exact date of this prestigious event every year. 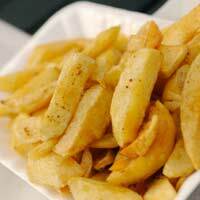 Events around National Chip Week usually attract a fair amount of press coverage and chips shops up and down the country use it to get the local communities involved, as well as an opportunity for competitions and promotions. The Brits are a nation of pie lovers – anything you can imagine has probably been baked in a pie at some point (four and twenty blackbirds, even) so it doesn’t really come as a surprise that pies have their very own celebratory week too. Chicken Tikka Massala was voted the nation’s favourite meal a few years ago, and curry is a definite favourite with spice-loving UK residents. Celebrating this, we also have a National Curry Week which was invented in 1998, not just to promote the cuisine but to raise money for charities dealing with the effects of hunger, malnourishment and poverty. The week usually takes place in mid-October, and generates a fair amount of publicity. The initiative has its own website which gives details of the events happening across the UK. During the special week of events, many UK curry houses put on special Curry week events to raise money for good causes. There are special curry week dinners, curry eating attempts, auctions and many more events all designed to raise money that will be put towards relieving poverty and suffering in South Asia and the rest of the world. If that’s not an excuse for a curry, we don’t know what is. Go Nuts for Doughnuts on National Doughnut week! If a little sweet treat is more your guilty pleasure, be out and proud with your sugar habit in May. National Doughnut Week takes place in May and it’s a week-long doughnut-fest which gives participating bakers and coffee shops (and their happy customers) an opportunity to raise money for The Children’s Trust using the power of the doughnut. 2011 will be the 20th anniversary of National Doughnut Week and the event is being promoted in ever more innovative ways, with Facebook and YouTube getting involved, as well as local radio celebrity sponsorship and in-store promotions.